Social media can sometimes be such an aggressive confrontational space we often take our passion to market and trade verbal blows in intellectual or all out slanging match style. But what happens when the subject touches a genuninely raw nerve that so distresses that you feel like an open wound. This happened when Ceil the Lion, lured from the boundaries of a Zimbabwe national park, was shot, beheaded and skinned by a Detroit dentist. Cecil’s killing appeared to be receiving more of an outpouring of outrage and than the murder of Sandra Bland, #SandraBland, a black woman found dead in a cell after being arrested for a tenuous traffic charge. Memes were posted timelines and pages lambasting those who, whether black or white seemed to have time to mourn and express more outrage for a lion over a black woman. I had posted on Cecil just the day before.Sandra a couple of posts two or three days before. More often I ignore self-rigtheous finger wagging and “sheeple” name-calling that masquerades as humorous pokes in the ribs, but this time those memes got under my skin. They were talking about me placing my own life as a sub-creature to a Lion. I had posted regarding the death of this majestic cat as a reflex to the most confusing group of feelings coursing through my body. Grief. And depression – my own and in the context of the suicides of men in their maturing prime. This was the most intense sense of grief I had ever felt. So intense I chose to numb myself knowing that I had a pressing year of work ahead that didn’t have space for me to in a state of grief – bills have to be paid #freelanceartistslife. And diving into work felt like a good move anyway. It would take my mind off it all. 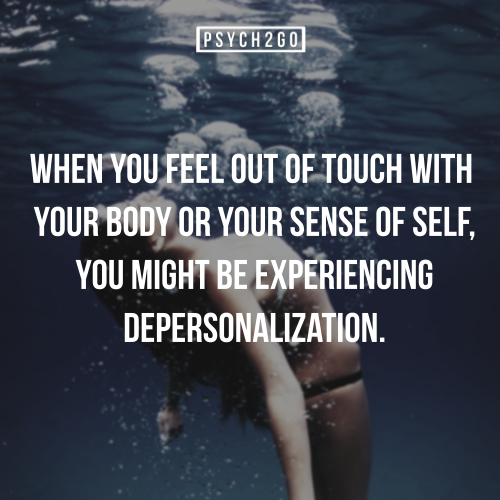 The idea of the depersonalisation grief can invoke is not to be sniffed at. There is the grit for survival that lives in our bowels that picks up one foot to place it in front of the other when your head says ‘bed all day’. Some days it’s the only logical place for existence on that day. Or for 3 weeks. But there is also a culling of parts of the self that takes place when death as a life experience forces the mind and spirit (but not always the heart) to swell. 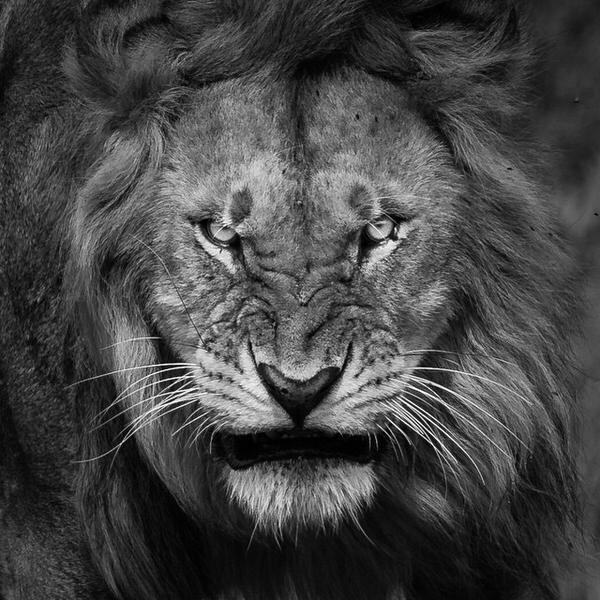 Mood swings: shock, anger, vulnerability, guilt. Your body feels infected with grief. However, what is more heart stopping is the outer-body experience brought on by shock. It is grief that often snaps us out of any self constructed delusionary existences we have built around ourselves to survive, maybe even thrive under the pressure of 21st century living. For anyone who has seen the film The Matrix, death, like the red pill, will slap you with your own mortality, those of you loved ones , rendering you wide awake to the brevity and fragility of this life we have. Especially if the death is sensless. So there are no words to describe how ritualistic destruction of life based on skin colour that is the same as yours has multiple impact upon you. The body responds to that knowledge in sometimes terrifying Facebook and twitter timeline starkness, festooned with graphic videos or images, news items and panel discussions. Living in London observing the daily killing of unarmed black people in America, only makes me more fearful to turn my attention to the UK, because its figures for deaths during or after police contact, and the clandestine but legal payouts to families for any assaults are hidden in stats labelled “unstable state of minds”. Where mental health id reserved for white male perpetrated mass shooting, the UK mental health system bulges with disproportionate numbers of people of African descent. Looking further south east across the planet, to the continent of Africa the press is peppered with conflict as it transitions onto the global (legal and illegal) economic market. As a black woman artists I 1) imagine my younger self in the position of the Chibok Girls 2) II imagine myself an elder who may have seen many years of conflict in struggles from colonial independence. Now its resource driven tribal and religious tensions that reek havoc. In the Latin Americas, women of colour experience highest levels of disappearance and violence with no recourse or recognition. Yet, all is obviously not doom and gloom. Black women are high achievers excelling exponentially in academia, entrepreneurship and development. So the polarization of pride in our potential and despair at our nonsensical systemic deaths is an emotional roller coaster ride. Its exhausting. Some days I feel neither youthful, wise or useful, and the logic of bed rest wins because I might begin to feel my toes leave the ground. And the only thing I can bring myself to do is browse the net for gossip, watch an entire series of Scandal and eat Aldi’s version of Ben and Jerries Double choc cookie do ice-cream. Phone off. Emails prohibited. If I do touch in on Facebook and I might catch a glimpse of a police man’s fist about to land viciously on a black woman’s face or a video with cats in it, kitty could win hands down. 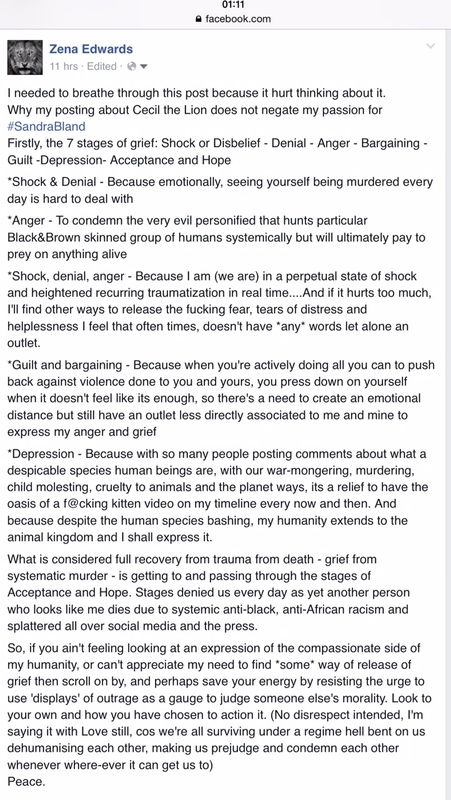 But on this particular day, someones Facebook comment got under my skin, so I decided to post about the anger I felt at the dedentist that had hunted and murdered the national symbol of Zimbabwe, Cecil The Lion, when Sandra Bland looked back at me in my bathroom mirror. Next Post Tale of 2 Cities – Gentrification or Regeneration?